The renovated visitor center of the Gateway Arch in St.Louis, Missouri, features several decorative metal systems including exterior wall panels. The Gateway Arch in St. Louis, Missouri, has been a part of many St. Louisans’ memories for the past 50 years. 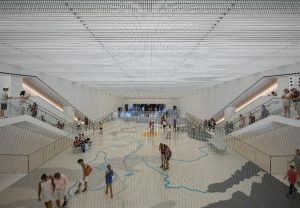 The famous monument explains American history through its world-class museum that recently underwent a $380-million renovation. With 4181 m2 (45,000 sf) of new museum space, including exhibition galleries, public education facilities, and visitor services, the expansion reinforces a modern telling of American history with a more inclusive viewpoint. The project’s general contractor (GC) was St. Louis-based McCarthy Building Companies. The designers included architect Cooper Robertson, James Carpenter Design Associates, and Trivers Associates. IWR North America installed the decorative metals package for the Gateway Arch’s visitor center. IWR started work on the project from March 2017 to June 2018. For the renovation, IWR installed several, detailed decorative metal systems with tight tolerances. The fabricated systems include custom wire and cable security screen, monumental stairs, stainless steel tri-wire screen wall cladding, guardrails, and entrance grilles and grates, glass handrails, radius louvers, and green screens. The museum has been designed as an ‘inwardly facing cone.’ This design created a constantly changing radius for many of the parts, making fabrication and installation tolerances virtually non-existent to achieve the correct alignments between systems. Many of the installed systems had a three-degree angle and slope, creating an out-of-plane design. The project team implemented a diligent shop drawing process for each feature to strategically prepare, measure, and coordinate the alignment of the systems to the concrete structure. The most customized parts of the renovation include the stainless steel tri-wire cladding and security screen. The cladding system is located at the center’s entrance and sits flush with the edge of a grassy berm. It features 120-inward facing—each approximately 1-m (3-ft) wide—metal panels constructed of individual, triangular-shaped components. A stainless-steel guardrail is at the top of the wall. The outer surface of the screen is flat, while the inside has an angled profile accented with lighting from below. The fabrication of each guardrail section and panel required precision due to its three-degree angle and slope to satisfy the elevation changes. The entrance also has stainless steel grilles and grates flush with the concrete and terrazzo walkways. The 431 vertical wire and cable security screen is located between the back of the entry floor and the mezzanine. It acts as a barrier from possible safety hazards before visitors go through the security checkpoint. This custom-built system spans 16-m (60-ft) from wall to wall and is separated with a horizontal rod tensioned to 11 kg (24 lb). After passing through security, visitors can choose one of the two, two-story monumental staircases on opposite walls to reach the museum’s entrance on the main level. When traveling down the stairs, there is an opening to the mezzanine where a room-sized floor map of the United States with marked trails sits. In close proximity to the outside of the Visitor Center and the Gateway Arch is an air intake system with a green screen integrated with 2-m (5-ft) radius louvers. The green screen is 6-m (14 ft) tall and 4 m (8 ft) in diameter. It acts as a trellis from which vines and climbing plants can grow. For this project, the construction manager had multiple superintendents onsite managing different scopes for each area of the renovation and addition. The coordination of multiple vendors was a challenge as each custom-designed piece required different installation processes. Careful planning and effective communication between all the project teams ensured a successful completion. The project has also won the Leadership in Energy and Environmental Design (LEED) Gold certification.